This journal series is the hottest selling and most expansive line of themed / guided journals on the market! They are wildly successful due to our trademark easy to fill in format that makes journaling easy and fun. We offer something for every age and interest with over 65 titles in print. Just Dance - The Dancer's Journal (Discontinued) *limited quantity available! The Color Collection features the same guided format as our original Kraft Collection but is available in a beautiful palette of warm inviting colors accented with a matte crackle finish and raised window frame. This collection of jumbo notepads is sure to keep you organized. 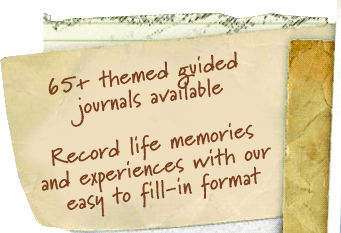 True to the Journals Unlimited style, each notepad features a specific theme and 50 formatted pages. These eye-catching note pads pair nicely with our journals for exceptional gift sets. The best gift that you can give your family is your time! Our Write to Remember journals are designed in a way that you can ask mom, dad, grandma, grandpa candid questions about their life while you record their story. We provide you with a list of conversation starters or you can include your own. With this interview technique, they will love spending time with you, whether in person or by phone. You both will come away sharing a special bond made of love, laughter, and memories. What are you waiting for? Go ahead and start the conversation.